A milky media screen from yesteryear! 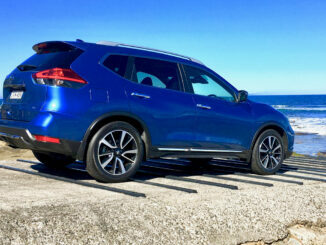 I went to the Cricks Honda dealership in Maroochydore on the Sunshine Coast where they very kindly let me test the Honda HR-V for BabyDrive! 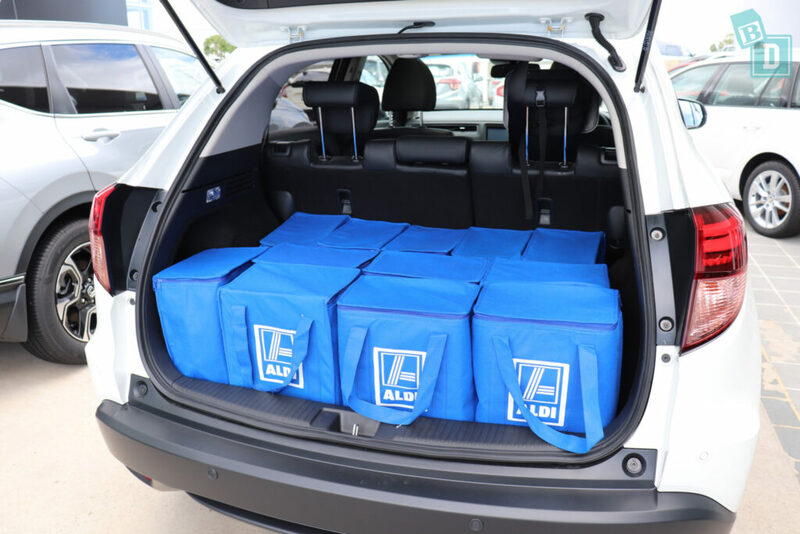 The Honda HR-V has good boot storage amongst its competitors, fitting 12 shopping bags in it when empty. The Mountain Buggy Duet twin stroller fitted with two bags. And the Britax Flexx tandem and single strollers both fitted with five shopping bags beside them! Storage in the cabin was poor, the door pockets were tiny, there was no glasses case and the central console storage box was not worth having it was so small! Storage in the back did not get any better either! The media screen is small and very poor quality, the screen is so milky that it is hard to read and the reversing camera image hard to see. 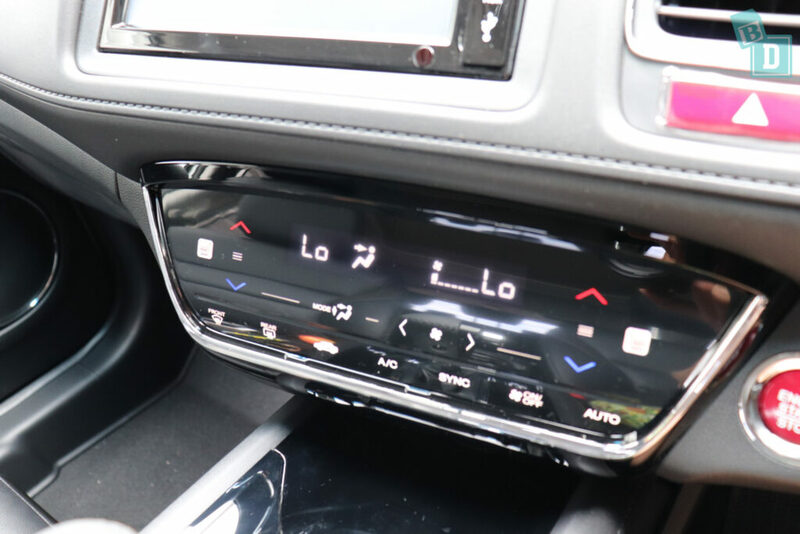 It doesn't have Apple CarPlay or Android Auto and I found it very old fashioned to navigate its screens of lists and hard to connect my phone to. There are three top tether points in the back, the outer ones are on the seat backs in the boot and the central top tether point is in the ceiling. 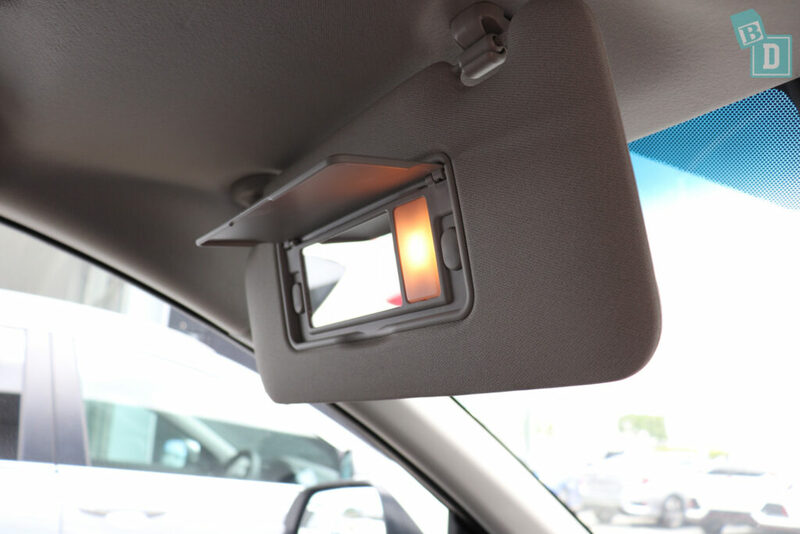 If you use this and the ceiling mounted central seatbelt then visibility will be poor out of the back for the driver. There are ISO Fix in both the outer seat bases behind slits in the leather upholstery. 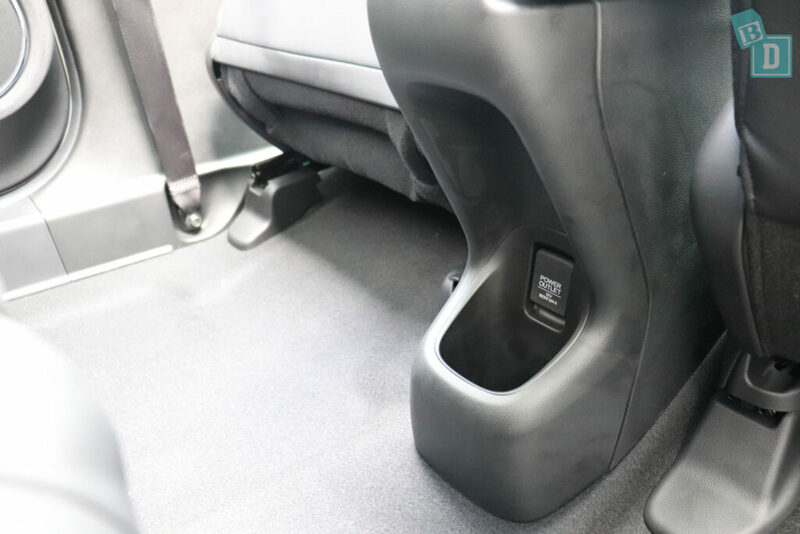 They were not too difficult to locate within the leather but the seat belt buckles for the central seat were positioned in front of the ISO Fix making it VERY difficult to access! 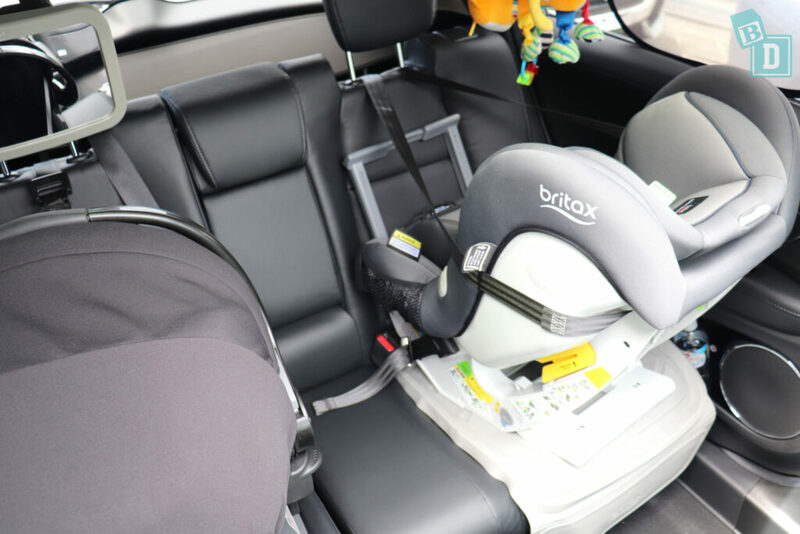 I could fit a Britax Unity infant capsule and the Britax Graphene child seat (rear facing) into the two outer seats, but there was no room between them for a person to sit or a third child seat. The interior of the HR-V really lets it down, it is plasticky and cheap feeling with no really endearing features. The Exterior looks good with its exaggerated shaped sweeping windows but I found they affected the driver's visibility quite badly and made it difficult posting Bub in and out of their child seat from outside. 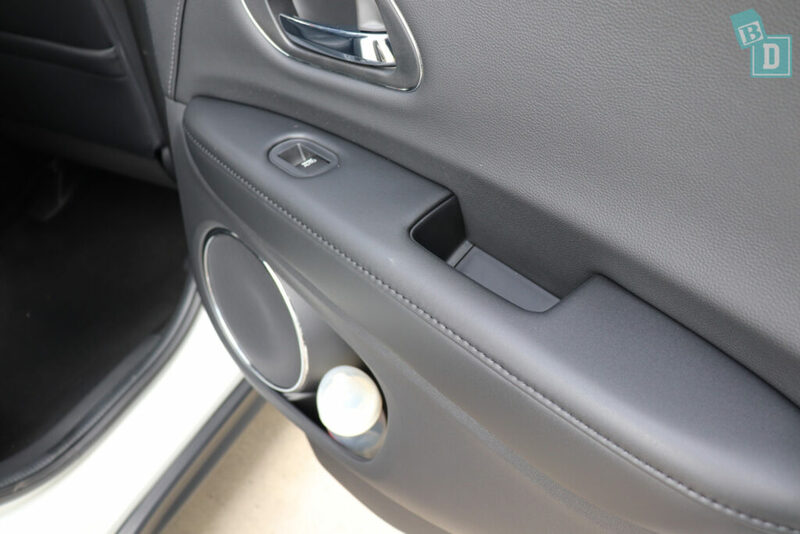 Also, the higher positioned door handles were hard for children to reach to get into the car! The Honda HR-V scored a five-star ANCAP safety score in 2015. 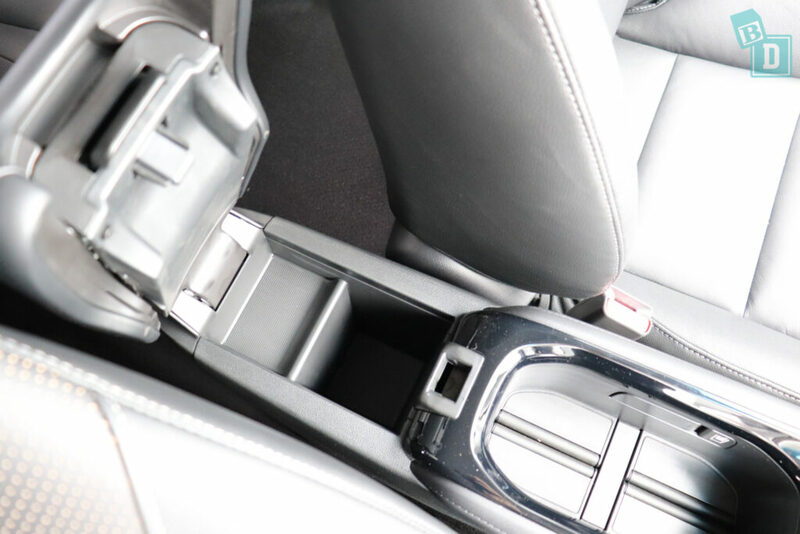 The Honda HR-V has two cup holders in the central console. The holders can be retracted into the walls and convert the area to a storage well. They will hold a disposable coffee cup or a refillable coffee cup and while a large refillable water bottle does fit, it would rattle around. The central console storage box is minuscule, I am not sure what the point of it would be?! It does have a little rubber mat at the bottom of it to stop anything moving around. The lid doubles as the armrest too. The door pockets are also tiny, they would only hold a 600ml water bottle or Pigeon baby bottle. They wouldn't hold my large refillable water bottle or wallet or iPad. The glove box is not enormous, but without a manual inside it would hold my iPad and wallet. Wth a manual in there I think you would struggle. 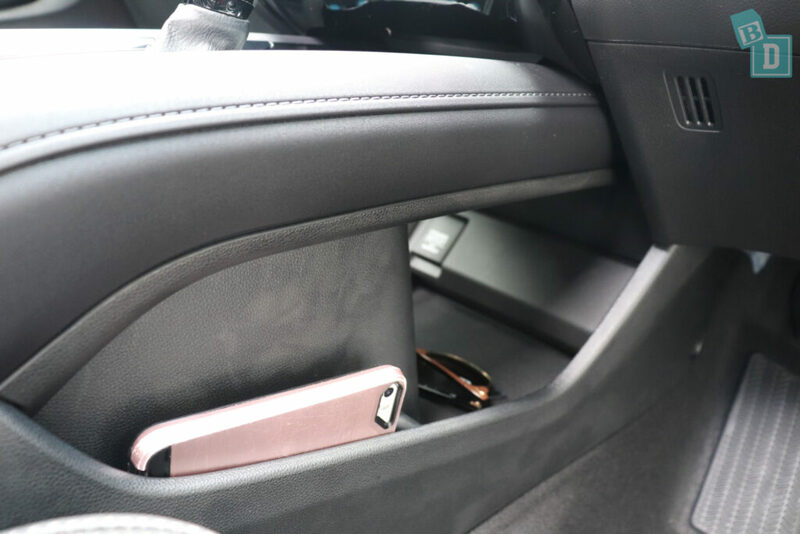 The central console has a shelf underneath the gear lever and is the only place to store your phone, keys and sunglasses as there is no glasses case in the ceiling. 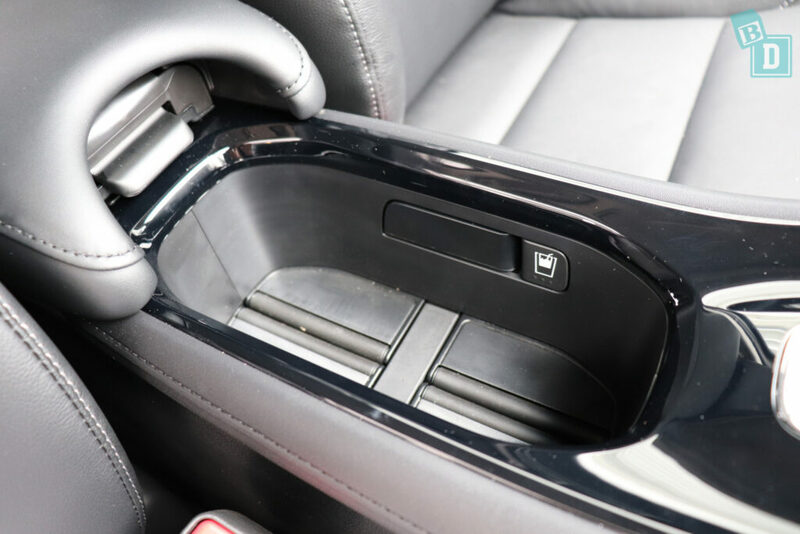 The shelf runs around the sides as well, level with the front passenger's thighs. There is a 12V socket in there and the USB socket is on the media screen so you would have to run a wire to there. In the back, storage space is really limited too and the door pockets so small that only a 600ml or Pigeon baby bottle will fit. At least there are little wells that provide good storage in all the door handles. 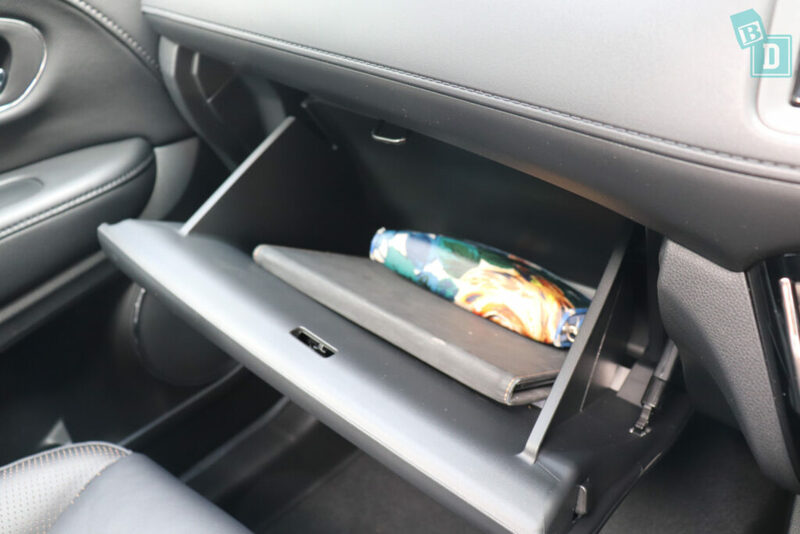 In the back of the central console storage box is a space you could put a coffee cup into when stationary, or a 600ml water bottle. And there is a 12V socket in there too. There is a fold-down armrest in the central seat back but there are no cup holders in there. There are small map pockets on the back of both front seats they are solid so you can't see whats inside them. They are just a centimetre too short to conceal an iPad, but will hold one. 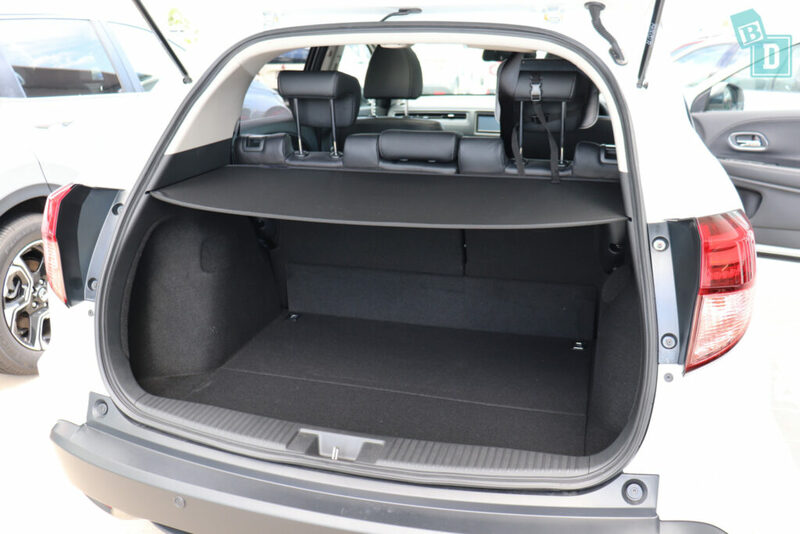 That is it for storage in the HR-V, it is very minimal and not really enough for a family car! Putting things in and out of the boot is good, the boot floor is at a good height that you are not bending down and in awkwardly. An emergency nappy change is possible on the nice, flat boot floor as well. When the boot of the HR-V is empty I could get 12 shopping bags in there, which seems to be the average amount for this size of car. The boot space and its functionality are really important. I like to have a big boot space and little side wells or areas I can divide things into. So something I don't want to move around while I'm driving such as Tulsi's lunch bag or her wet swimming gear can be sectioned off in a little well where it's not going to spill or get squashed by the rest of the things in the boot. Hooks for securing shopping bags to are also favourites of mine, I like being able to secure the bag containing more fragile things like eggs so they don't move around on the journey. I measure the boot space in freezer shopping bags, prams and dogs. Not because I think all there is to a mum's life is food shopping, prams and dogs. (Although it can feel like it sometimes!!) But because these are visually mesurable items we can all associate with. 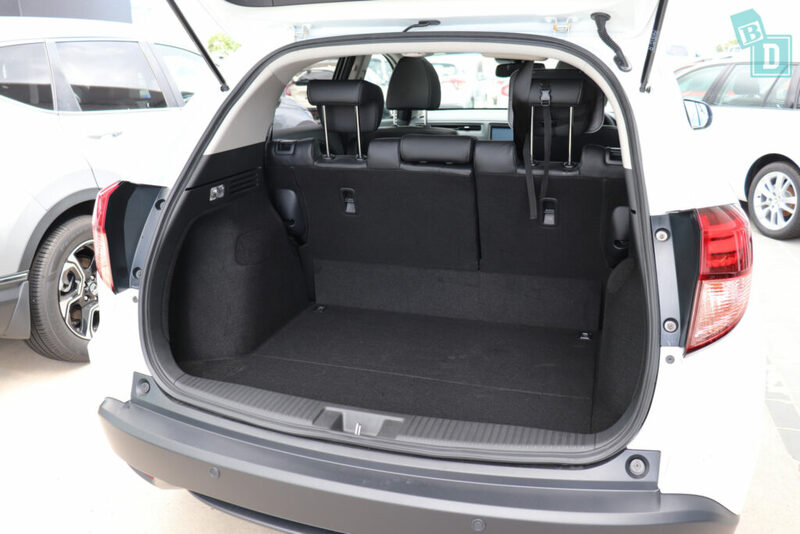 For me, the car company boot measurement of litres ia not an amount I can easily visualise and 400L in one car may differ in usability to that in another due to the configuration or shape of the space. In the boot, I could get the Mountain Buggy Duet twin stroller with two shopping bags in alongside it. 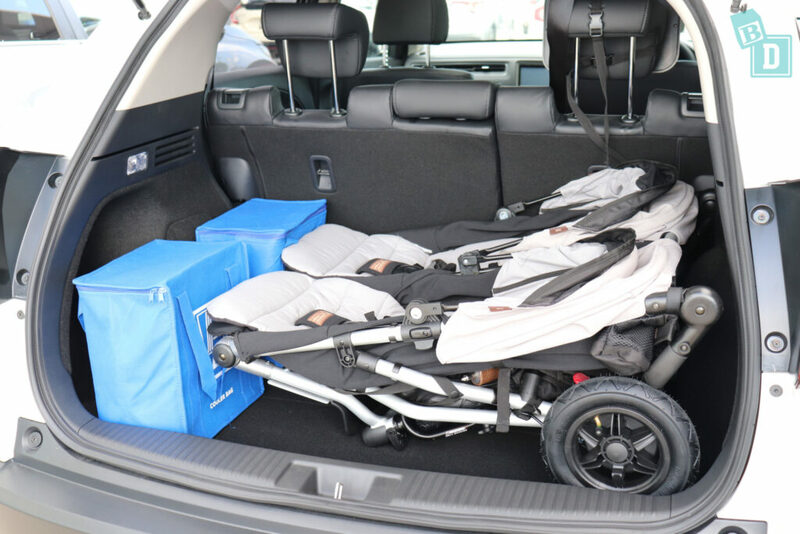 At first glance, I didn't think the boot would be big enough but the Mountain Buggy Duet twin stroller fits in really nicely. 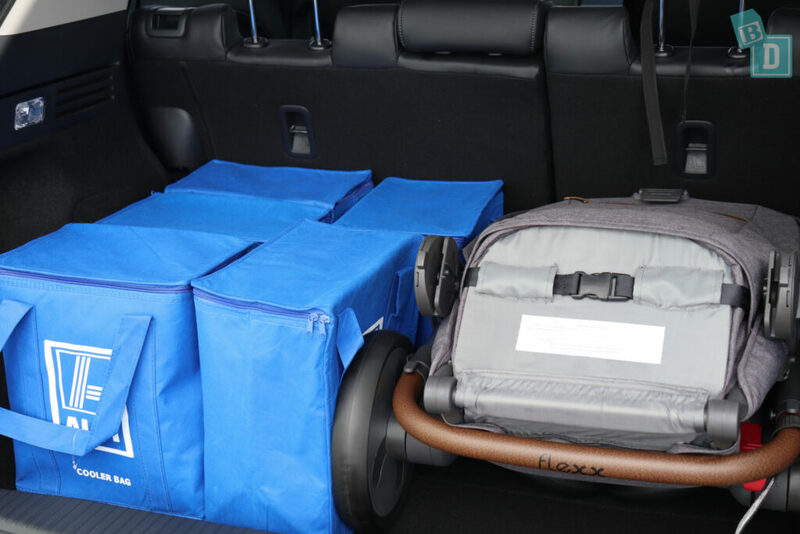 The Britax Flexx single stroller fitted lengthways in the boot and I could get five shopping bags in alongside it. The Britax Flexx tandem stroller just fits in lengthways too. 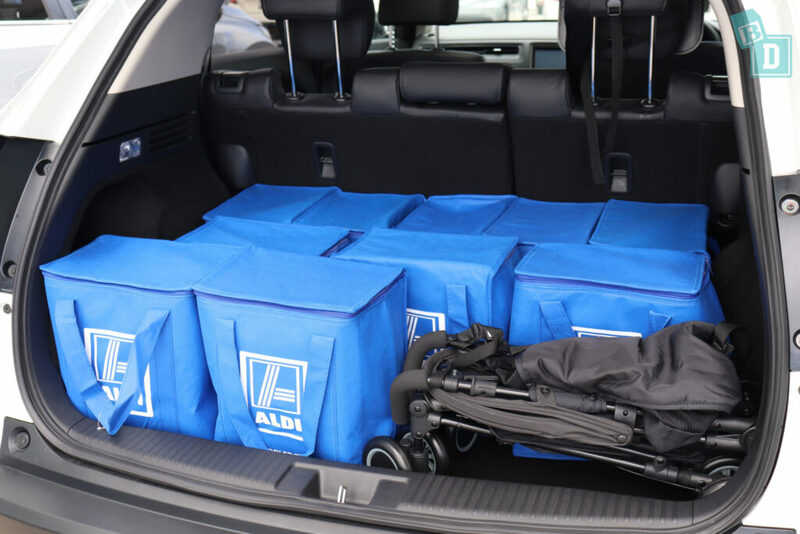 Which is really good as it leaves half the boot empty for your other storage. So I could get five shopping bags in with the tandem Flexx too. 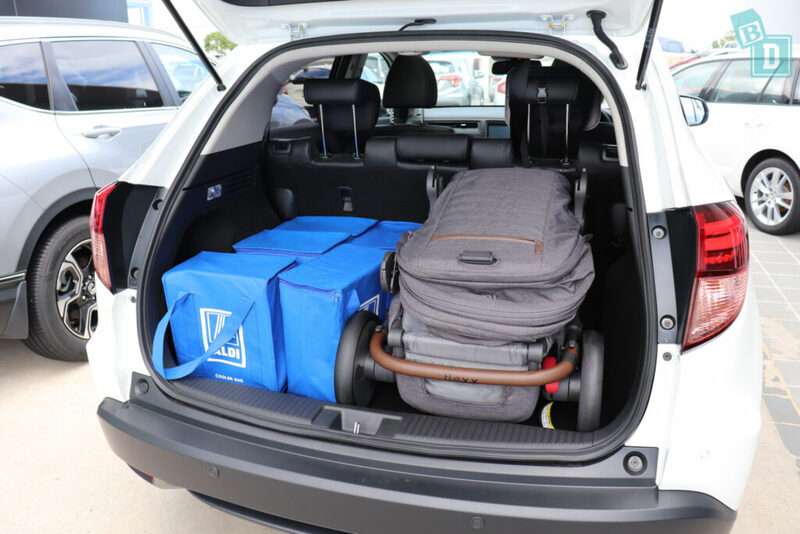 With the Britax Holiday compact stroller in the boot, I could get 10 shopping bags in with it. There is a 12V socket in the boot and a cheap feeling, plastic light on the right-hand side. The boot feels basic, especially the cargo blins that is a mesh net on a wire hoop. It doesn't actually connect to the car, just slides into a small groove along the side so if you it would easily pop out unintentionally. I have never seen a cargo blind as basic as that! 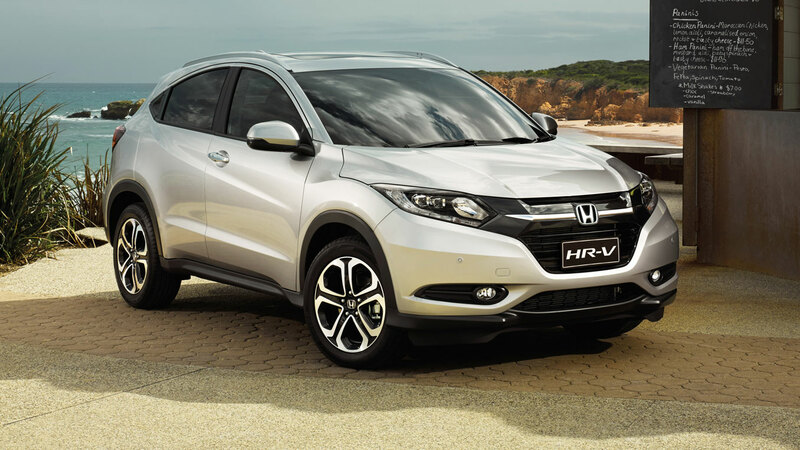 When you first start the Honda HR-V you get a lovely, very loud ‘ding, ding, ding' chime! WHY!!? If your baby was asleep then they won't be for long!! It's where I think we need to be able to strike a balance and choose when we can mute the warnings or swap them to a vibration in the steering wheel or flashing light perhaps? Another thing I have realised is I spend my time in a lot more places where small children roam, parks, beaches, play gyms, swimming lessons, daycare centre etc. I have become more aware that when I'm reversing or manouvering in the car parks I have to tripple check for small children running around behind me or being in my blind spot when reversing. For this I LOVE reversing cameras, I just don't like their beeping sounds!! I have become so much more aware of safety and potential accidents or hazards since having a child and so I love the peace of mind that I get from the cameras and sensors combined with my own vision from windows and mirrors as I don't trust cameras alone. In the digital display in front of the driver tells you which seats have their seatbelt done up, which is a good BabyDrive feature. 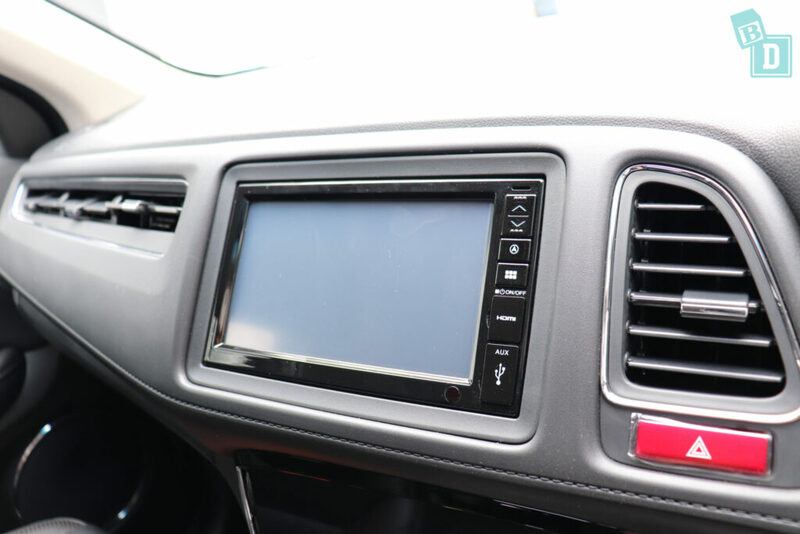 The air-conditioning is controlled by a digital screen that beeps every time you touch it, which is really annoying and just feels like it is technology for the sake of it?! This beeping would definitely disturb a sleeping baby! There is dual climate control and both front seats are heated too. The only thing is the beeping every time you press a button?! The media screen is just such poor quality, it is like looking through milk, you can hardly see anything! On the options screens, I find it hard to even read the words on it! 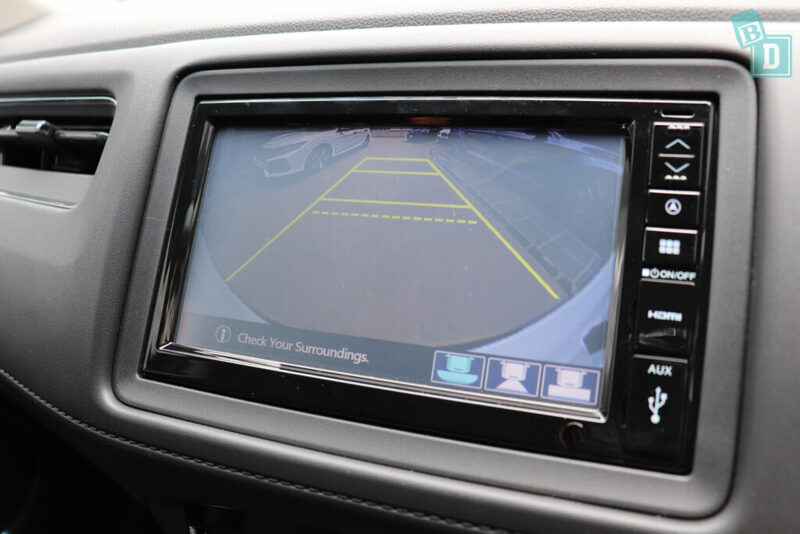 The reversing camera visibility is laughable, you would not want to trust it! 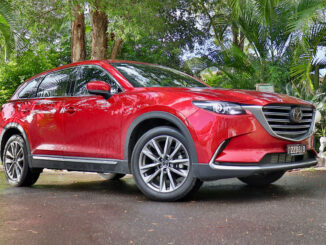 You can select three different views but it's really not worth it, as it is so pixelated and poor quality, it is hard to believe it is a new car! 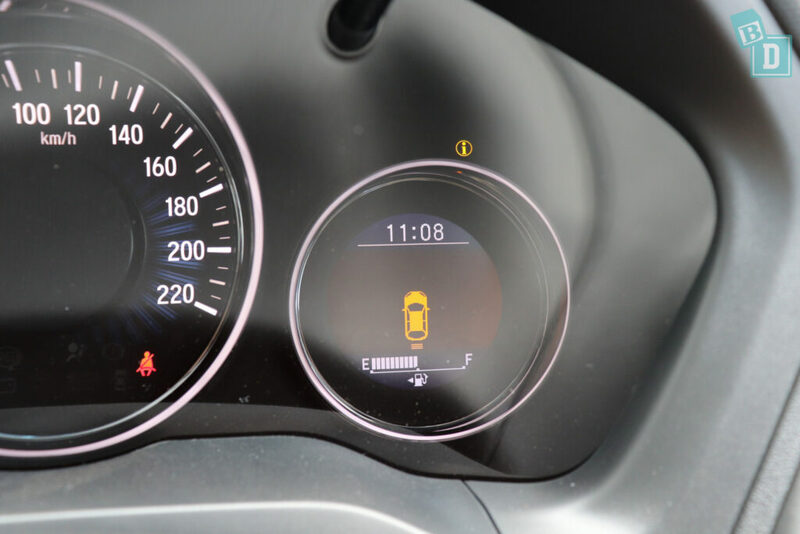 The rear parking sensors make a loud beeping noise and this display comes up on the digital in front of the driver to show where the hazard is. I found this a bit ridiculous, it is so vague and poor quality image like something from an 80's arcade game! There are no front sensors. 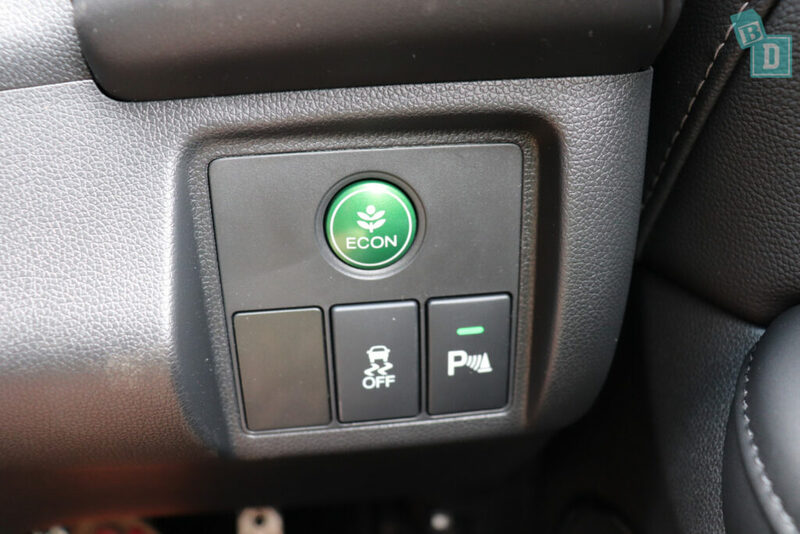 You can turn off the parking sensors with a button by your right knee, which also turns off the digital display but not the reversing camera. I could not find a way to mute the sensor sound alone but really the little sensor visual is no use anyway! The indicators in the HR-V have a quiet sound with a light ticking noise. I don't think they would disturb a sleeping baby. 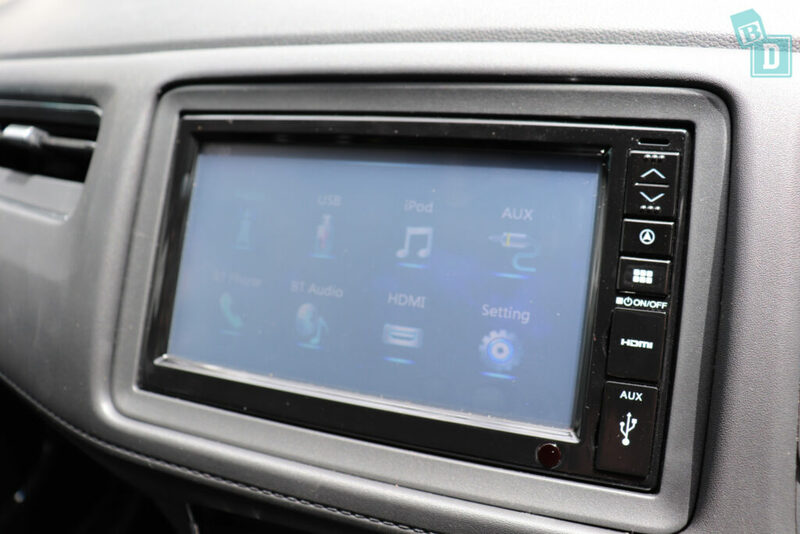 The media system in the HR-V does not have Apple CarPlay or Android Auto. You can connect your phone to it using an HDMI or USB lead but I just did not find it easy to connect to and use at all. The windows are quite quiet to open and close and the doors are quite quiet too! The doors and windows can be locked from the driver's door panel. With baby asleep, you can get in and out without worrying the doors will be too noisy. The same for the windows their mechanism is not too noisy but I did notice them having a bit of a clunk closing sound. I also noticed that you can't come to a stop and open the door without the car making a single beep noise?! I don't know why it does it but it's a little annoying! There are three top tethers for the rear seats, the outer seats have it in their seat backs and for the central seat it is in the ceiling. There are ISO Fix in both the outer seats. 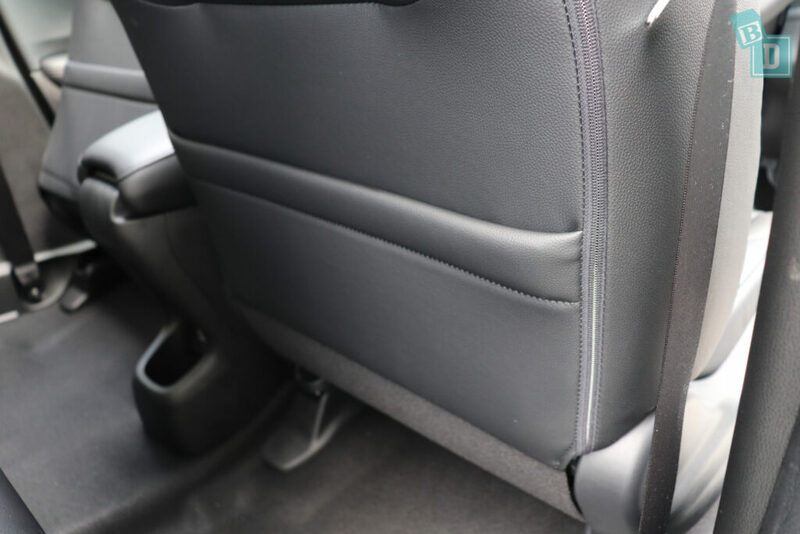 The ISO Fix are situated within a slit in the leather upholstery and they were not too hard to locate and connect to but the seat belt buckles are all over the place! They are right in front of the ISO Fix and really got in the way making it hard to access, it feels like a real dog's dinner of buckles thrown around everywhere! 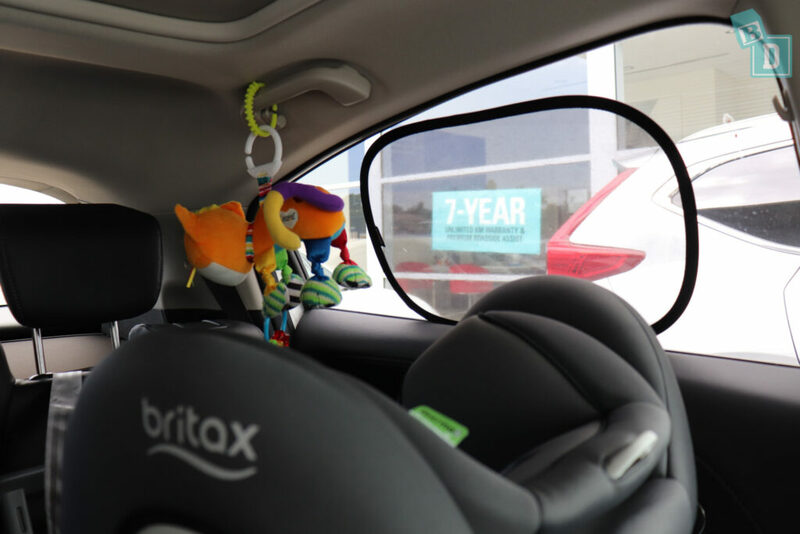 I installed two rear-facing child seats in the outer seats using the ISO Fix, the Britax Unity infant capsule and the Britax Graphene. I could not fit a third child seat in the central seat and there is no room between the two child seats in the back for anyone to sit there. 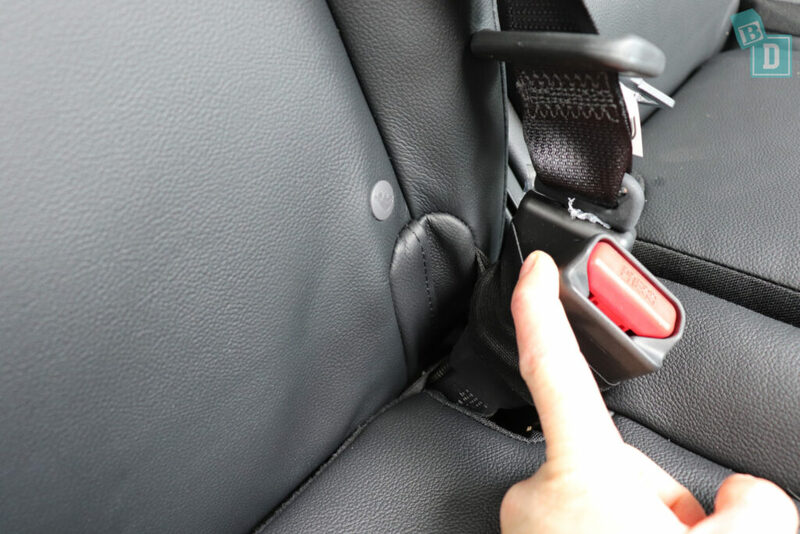 If you did install a child seat just in the central position, the top tether anchor point is in the ceiling so visibility would be affected quite badly for the driver. Connecting the top tether straps was really nice and simple and you can reach easily across the boot to fasten them. The rear seat backs are split 60:40, if you want to bring the seat backs forward to reach the top tethers instead. 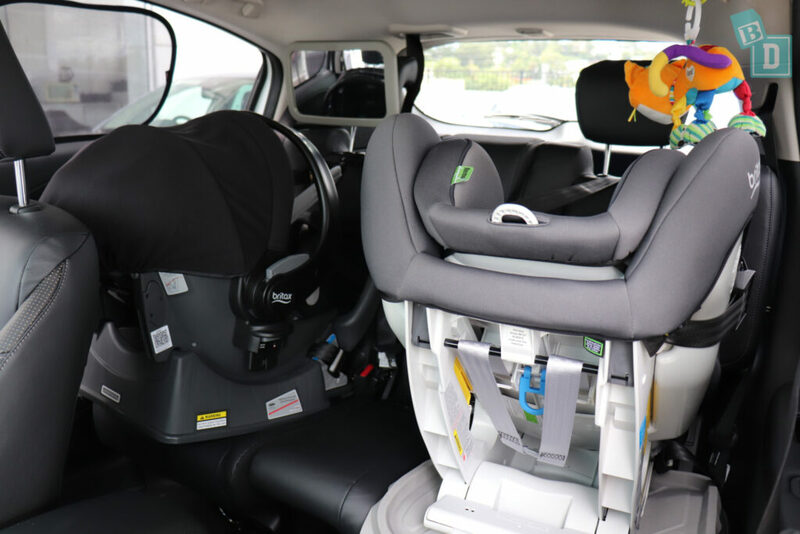 With a rear child seat installed the front passenger seat has 20cm of knee room. I am 162cm tall and I feel like in the driver's seat I have a fair amount to room so someone taller could definitely drive too. 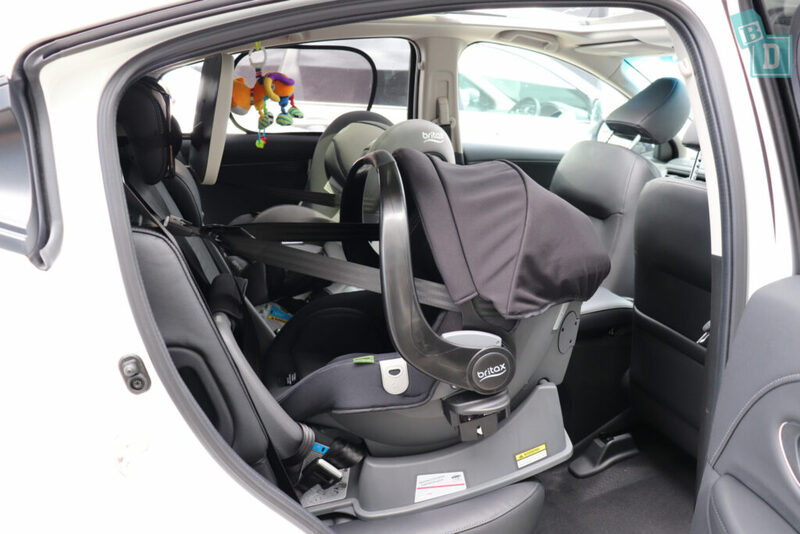 Posting Bub into their child seat from outside the car is difficult because the roof and doorways slope down at quite an angle toward the back that just means there is not the headroom to post them in and out easily. From inside it is much better. The HR-V is a five-seater SUV, but I find the front seats really uncomfortable. The bottom of the lumbar support sticks really far forward so your back has to do a ‘C' shape curve. I could not find a lumbar adjustment lever so that must be the shape of the seats! I found that because of the big curve, my shoulders sat far forward and my head was not near the headrest so at least I could wear a ponytail! The rear seats do not slide to adjust the legroom but they do have an enormous cavity underneath them?! Instead of the seat base going down to the floor it is empty underneath the seats so you can use it as storage! In the dashboard on the passenger side is one long air vent and there is one either side of the steering wheel too. The air-conditioning is very effective but it is very loud also and I think having the long vent may be a bit too much, I can't imagine having that blowing at chest or head height is pleasant! At least you can change the angle of them. 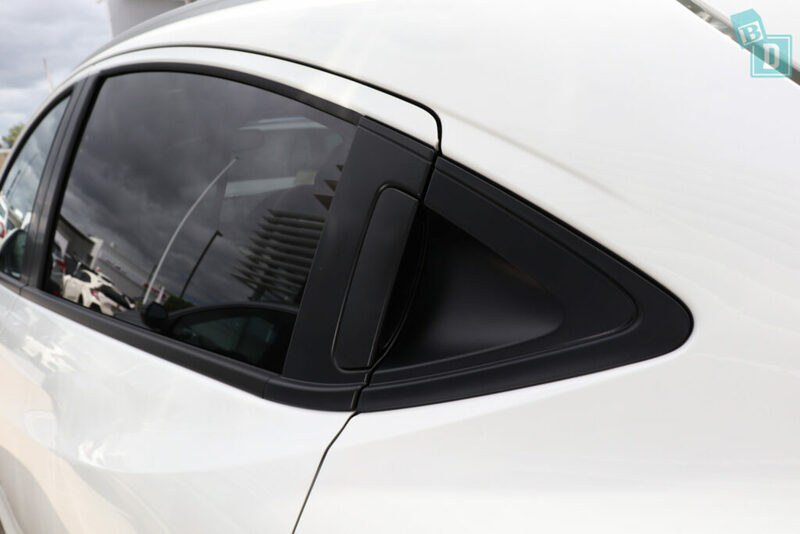 The rear doors have the handles incorporated into the sloping windows which means they are high up. I have had friends complain about this because their children can't reach them to let themselves into the car! Because of the shape of the windows also I found that a sun blind would not fit on them towards the back, which is a problem if you have little passengers and that is where the sun is coming in. Visibility for the driver is quite minimal out of the back, because the windows are so sloped and shaped. Also, the rear side pillars are really big blocking a large amount of vision. The rear windscreen also tunnels towards the back and with the large headrests too it all adds together to make visibility quite poor and that's without using the central seatbelt and top tether coming from the ceiling! If you threw those into the mix it would be atrocious! For rear-facing passengers I think the sloping windows affect their visibility too. There are lit vanity mirrors on both sides in the front. 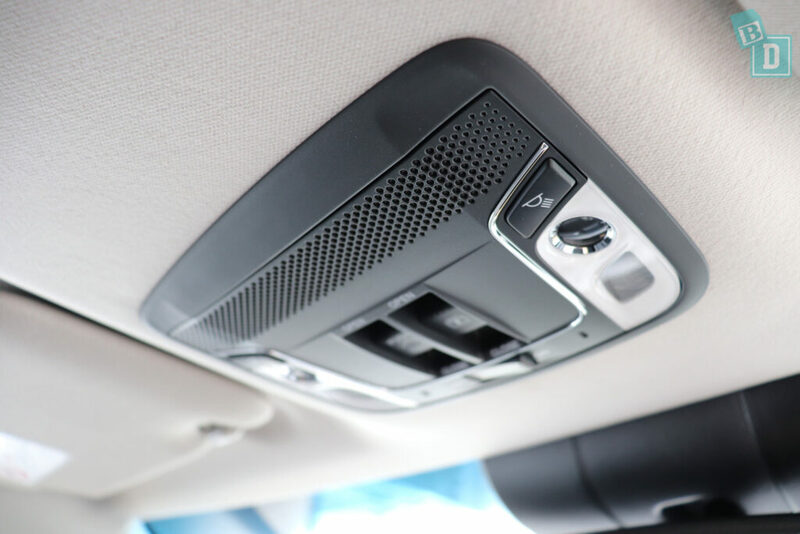 The ceiling lights in the HR-V are where the glasses case usually is located. Along with the sunroof controls. The rear lights are right back above the rear seatbacks so they are definitely not reachable by the driver and would be hard when putting Bub in and out of the car too! When reversing the left side mirror automatically moves downwards which is very helpful if you are parallel parking. 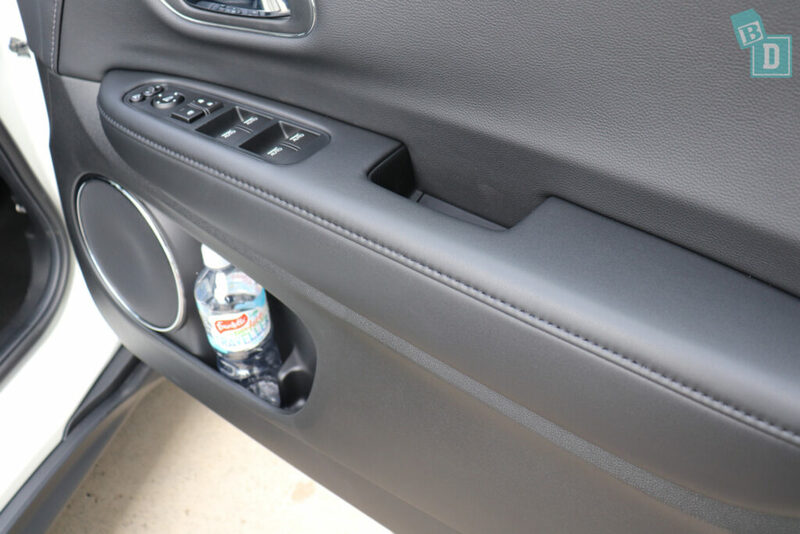 There are handles in the back of the HR-V above both doors and are well positioned to hold a baby toy. There are three 12V sockets; one in the boot, one in the second row and one underneath the central console in the front. The HR-V interior feels basic, cheap and plasticky to touch. The media screen is very poor and outdated. There are no floor mats either. The doors wipe clean easily. 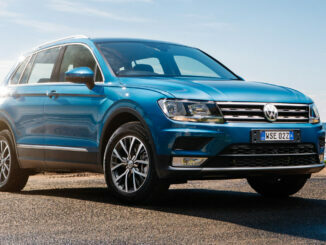 There is keyless entry and locking. The Honda HR-V scored a five-star ANCAP safety rating in 2015. It got an overall score of 36.22 out of 37. Getting 15.21 out of 16 for frontal offset test, 16 out of 16 for side impact and pedestrian protection was rated acceptable. The HR-V comes 6 airbags as standard, dual frontal, front side and side curtain airbags for front and rear side passengers. 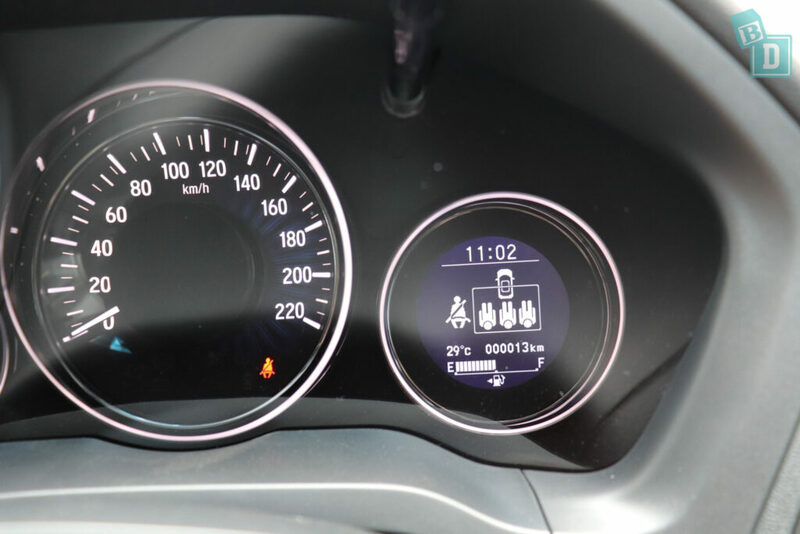 The HR-V also comes with electronic brake distribution (EBD) and emergency brake assist (EBA) are also standard. 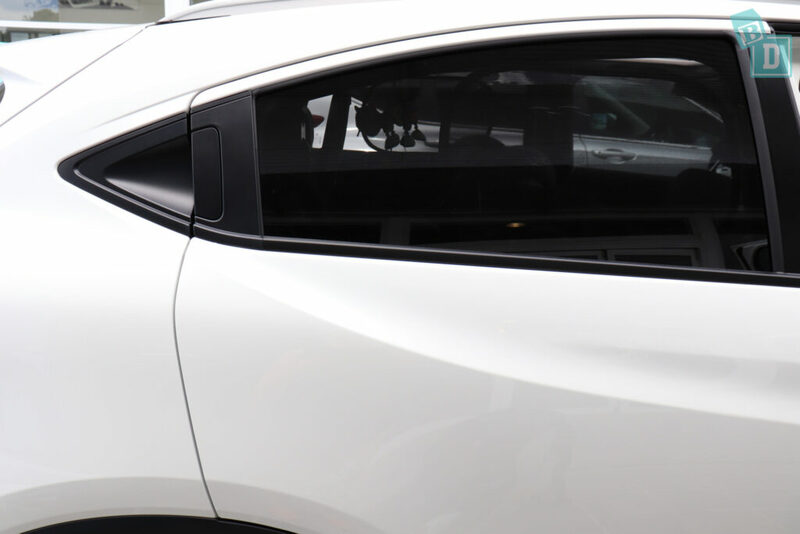 Autonomous emergency braking (AEB) is available for some variants.